These simple breakout boards are available on aliexpress for well under one Dollar (I got mine for 67 cent each, including shipping from China). These boards are my main development platform. They are very similar to the ESP14 Wifi-boards and most programs will work fine on those chinese gems as well. 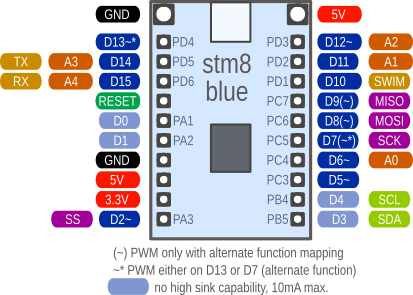 The STM8S103 breakout boards are build around a CPU STM8S103F3P6 with 16MHz internal oscillator, 8kB flash, 1kB RAM, and 640 byte EEPROM. The CPU includes a UART, SPI, I2C, PWM, 10 bit ADC, 3 timer, and up to 14 I/O pins - quite similar to an Atmel ATmega8. One (red) LED is connected to GPIO PB5 (CPU pin 11). This LED is low active. 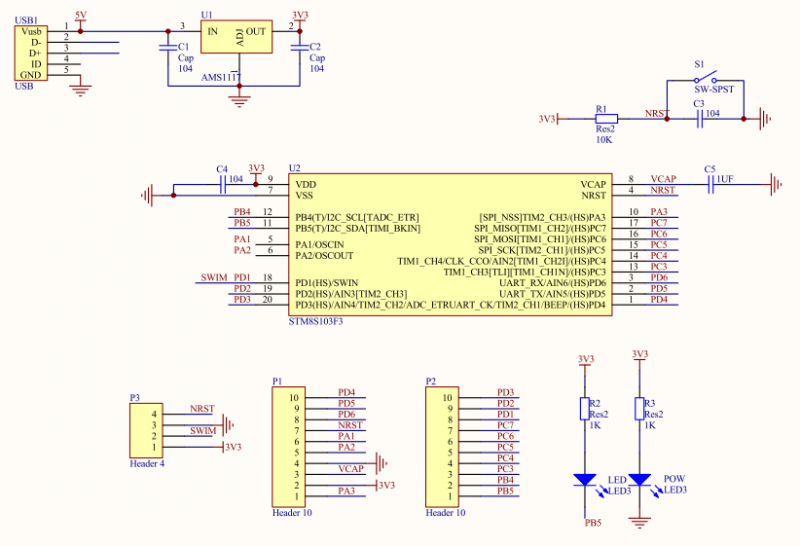 Please keep in mind that this is one of the I2C signals and using the LED blocks the I2C bus. The push button is for reset. The CPU runs on 3.3V, a linear regulator is integrated on the board. 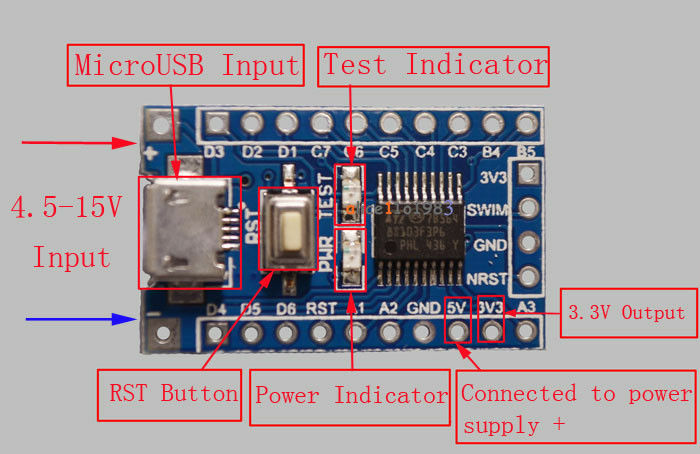 The micro USB connector is only for (5V) power supply, the data lines are not connected. All CPU pins are easily accessible on (optional) pin headers (pitch 2.54mm, perfect for breadboards). I am using the ST-Link V2 compatible flash tool in the green plastic housing. The one in the metal housing uses a different pinout. The Arduino environment uses its own pin numbering scheme independent from the physical CPU pin numbers. Many Arduino sketches and libraries contain hard-coded assumptions about the number of pins with special functions. Ideally, all these numbers would be the same and all programs could be compiled without changes. Here I discuss some possible pin mapping schemes and check how close we could get the the ideal mapping. Unfortunatly, it turns out that a perfect mapping is not possible. I am still not really happy with this mapping. Instead of simplifing things it only adds another layer of abstraction and confusion. To avoid this I added definitions for the regular CPU pin names like PA1 and PD2. In the end, this notation seems to be a lot easier to me. I am open for suggestions for a better pin number mapping. The pins D3/D4 (SDA/SCL, PB5/PB4) are different from the others as they are true open drain pins. That means, they only can drive the output low or open. To drive it high, they require an external pull-up resistor. This is the reason why the LED on this breakout board is connected between +3.3V and the pins and not between the pin and GND as usual. This way it is possible to drive the LED by writing a zero to the output register. D5/D6 (PA1/PA2, OscIn/OscOut) are weaker than the other pins. Try avoiding these pins for LEDs and other higher current applications.